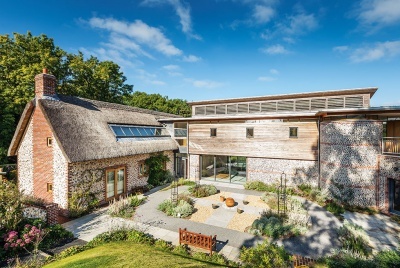 Anthony Lamb and partner Andy Andrews’ new eco self-build in Somerset is a masterclass in sustainable homebuilding — and much more besides. One of the first tasks Andy and Anthony took on was building the structure, which consisted of a Douglas fir frame (with wood sourced from Longleat and erected by James Ross from Cutting ‘Edge) around which a straw bale skin was installed. “We used straw from Wiltshire,” explains Andy. “The straw bale walls were staked with 4’ 6” lengths of hazel, and the bales laid in a regular stretcher course for stability.” The walls were then rendered externally in lime, while internally a mix of Warmcel and Pavatherm insulation was installed before being finished. With such a hugely efficient structure, Anthony and Andy decided against installing a conventional central heating system. 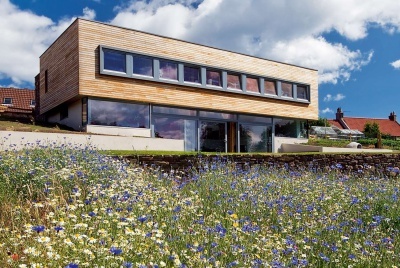 Instead, the house relies on a centrally located woodburner (the ground floor is largely open plan which helps the heat it produces to penetrate all corners) and a mechanical ventilation system with heat recovery. Additionally, two solar thermal panels provide the majority of the hot water (backed up with a regular immersion heater) while 22 PV (photovoltaic) panels provide up to 4kW of electricity. 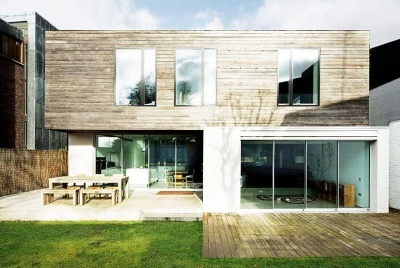 The windows, aluminium clad on the outside and timber inside, are triple glazed. 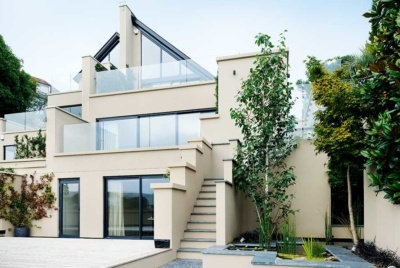 The supplier, Internorm, is a European company that builds triple-glazed windows as standard for its German customers, so there’s no extra charge to UK clients for this ‘upgrade’. Internally, there’s an understated rustic chic about the whole place and a very relaxed air (Anthony – who suffered a brain aneurysm whilst on site – confides that being in the house has been perfect for his rehabilitation). Indeed, it is easy to conclude that this house is low impact in every way but one — the very positive outcome for its owners. “We’re very proud of what we’ve done, both in terms of sustainability and the amount we did ourselves,” says Anthony. And who can disagree? A rather splendid house with a wonderful name. We wish Anthony and Andrew much happiness in their home.